The two most adorable superheroes on television are getting together for a crossover of shows between networks. CW's Flash is headed to CBS' 'Supergirl' to join forces against Silver Banshee and Livewire. 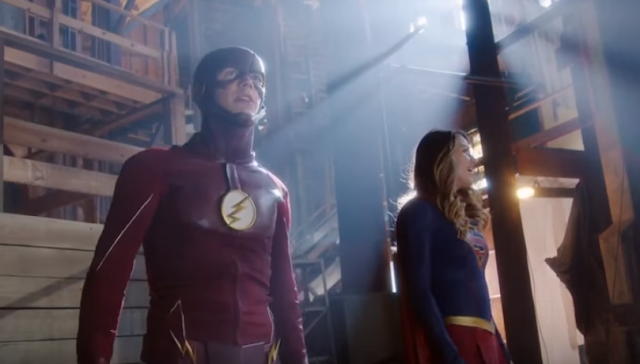 The episode entitled "World's Finest" has gotten an extended trailer (see below) as they race against each other and basically let the charismas of both Melissa Benoist and Grant Gustin shine through. If you're tired of dark and brooding comic book shows then this will be a potent elixir of fun and superheroics. The episode arrives Monday, March 28 on CBS at 8p.m. "Worlds Finest" - Kara gains a new ally when the lightning-fast superhero The Flash (Grant Gustin) suddenly appears from an alternate universe and helps Kara battle Siobhan, aka Silver Banshee, and Livewire in exchange for her help in finding a way to return him home, on SUPERGIRL, Monday, March 28th on CBS. Grant Gustin crosses over as The Flash.